Sir Arthur Conan Doyle, British writer, creator Sherlock Holmes, the best-known detective in literature and the embodiment of sharp reasoning. Doyle himself was not a good example of rational personality: he believed in fairies and was interested in occultism. 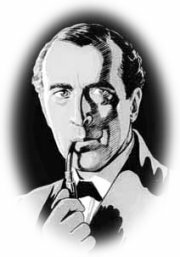 Sherlock Holmes stories have been translated into more than fifty languages, and made into plays, films, radio and television series, a musical comedy, a ballet, cartoons, comic books, and advertisement. By 1920 Doyle was one of the most highly paid writers in the world. Just as Andrew Jackson Davis was called the "John the Baptist" of Modern Spiritualism, Sir Arthur Conan Doyle was called the "St. Paul" of Spiritualism. He was a prolific writer on the subject and an avid proponent. And, of course, he is renowned for his Sherlock Holmes stories. Detective stories played an important role of the human literary history. It has got extensive readers in a worldwide because of its particular literary style, wonderful story line, logical consequence and unbelievable ending. A detective story was born by Edgar Allan Poe, the first detective novel < The Murders in the Rue Morgue > in 1841, and then the British developed this literary style, therefore, and Detective stories were become very popular in both of them. Because of British literature, Sir Arthur Conan Doyle created the detective called Sherlock Holmes is a gentleman. He is gentle as a noble. Arthur Conan Doyle was born at Picardy Place, Edinburgh, as the son of Charles Altamont Doyle, a civil servant in the Edinburgh Office of Works, and Mary (Foley) Doyle. Both of Doyle's parents were Roman Catholics. To increase his income Charles Altamont painted, made book illustrations, and also worked as a sketch artist on criminal trials. Not long after arriving Edinburgh he started to drink, he suffered from epilepsy and was eventually institutionalized. Doyle's mother was interested in literature, and she encouraged his son to take to books. Doyle read voluminously. Doyle had produced his first story, an illustrated tale of a man and a tiger, at the age of six. At the age of fourteen he had learned French so that he read Jules Verne in the author's original language. As his parents were Roman Catholics, he was raised in the Roman Catholic faith. While Doyle was training to become a doctor he started to read Darwin, Spencer, and Huxley. Their writings and his own disenchantment with religion caused him to become an agnostic. Doyle was educated in Jesuit schools. During this period Doyle lost his belief in the Roman Catholic faith but the training of the Jesuits influenced deeply his mental development. Later he used his friends and teachers from Stony Hurst College as models for his characters in the Holmes stories, among them two boys named Moriarty. He studied at Edinburgh University and in 1884 he married Louise Hawkins. Doyle qualified as doctor in 1885. After graduation Doyle practiced medicine as an eye specialist at South Sea near Portsmouth in Hampshire until 1891 when he became a full time writer. Charles Altamont died in an asylum in 1893; in the same year Doyle decided to finish permanently the adventures of his master detective. Because of financial problems, Doyle's mother kept a boarding house. Dr. Tsukasa Kobayashi has alluded in an article, that Doyle's mother had a long affair with Bryan Charles Waller, a lodger and a student of pathology, who had a deep impact to Conan Doyle. Doyle's first story about Holmes, A STUDY IN SCARLET, was published in 1887 in Breton Christmas Annual. The novel was written in three weeks in 1886. It introduced the detective and his Sancho Panza and Boswell, Dr. Watson, the narrator of the stories. Their major opponent was the evil genius Moriarty, the classic villain and a kind of doppelganger of Holmes. Also the intrigues of the beautiful opera singer Irene Adler caused much trouble to Holmes. The second Sherlock Holmes story, �The Sign of the Four', was written for the Lippincott's Magazine. The story collects a colourful group of people together, among them Jonathan Small who has a wooden leg and a dwarf from Tonga islands. The Strand Magazine started to publish 'The Adventures of Sherlock Holmes' from July 1891. Holmes's address at Mrs. Hudson's house, 221B Baker Street, London, became soon the most famous London street in literature. However, already at the end of 1891, Doyle planned to end the series and in 1893 he became so wearied of his detective that he devised his death in the 'Final Problem,' published in the Strand in the December issue. Holmes meets Moriarty at the fall of the Reichenbach in Switzerland and disappears. Watson finds a letter from Homes, stating "I have already explained to you, however, that my career had in any case reached its crisis, and that no possible conclusion to it could be more congenial to me than this." 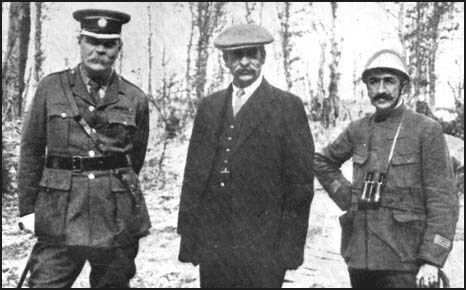 During the South African war (1899-1902) Doyle served for a few months as senior physician at a field hospital, and wrote THE WAR IN SOUTH AFRICA, in which he defended England's policy. The same uncritical attitude marked his history of World War I, THE BRITISH CAMPAIGN IN FRANCE AND FLANDERS, 1928 (6 vols.). Doyle was knighted in 1902 and in 1900 and 1906 he also ran unsuccessfully for Parliament. Fourteen months after his long-invalided wife Louisa died, Conan Doyle married in 1907 his second wife, Jean Leckie. When his son Kingsley died from wounds incurred in World War I, the author dedicated himself in spiritualistic studies. An example of these is THE COMING OF FAIRIES (1922). But he had already showed interest in occult fantasy before publishing Holmes stories. In his early novel, THE MYSTERY OF CLOOMBER (1888), a retired general finds himself under assault by Indian magic. Doyle supported the existence of "little people" and spent more than a million dollars on their cause. The so-called "fairy photographs" caused an international sensation when Doyle published a favourable account of them in 1920. Doyle became president of several important spiritualist organizations. In 1925 he opened the Psychic Bookshop in London. His own psychic experiences Doyle recorded in THE EDGE OF UNKNOWN (1930), which was his last book. Doyle died on July 7, 1930 from heart disease at his home, Windlesham, Sussex. "On Monday, July 7, 1930, the world of literature, story telling, happy-home living, and the world of Spiritualism lost a leader. Sir Arthur Conan Doyle has passed over." "And so he has passed for a time, serving in a new sphere, we have no doubt, and immortal in our hearts, we are sure." Conan Doyle's other publications include plays, verse, memoirs, short stories, and several historical novels and supernatural and speculative fiction. His stories of Professor George Edward Challenger in THE LOST WORLD (1912) and other adventures blended science fact with fantastic romance, and were very popular. The model for the professor was William Rutherford, Doyle's teacher from Edinburgh. Doyle's practice, and other experiences, expeditions as ship's surgeon to the Arctic and West Coast of Africa, service in the Boer War, defences of George Edalji and Oscar Slater, and two men wrongly imprisoned, provided much material for his writings. 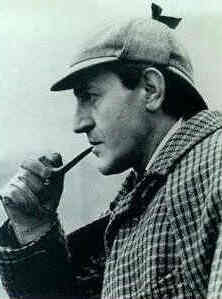 Holmes' character has inspired many later writers to continue his adventures. He has also appeared in many films, some of them rather irreverent, such as "Without a Clue" starring Michael Caine and Benjamin Kingsley. Holmes in the 1964 BBC1 series. The pictures came from www.fst.org.